Unlike his partner, Bernie Marcus, Arthur Blank does not seem to enjoy being in the limelight. A great majority of the book Built From Scratch, which the pair wrote in 1999, is from the perspective of Marcus. While Marcus talks a lot about his childhood, Blank says very little, instead picking up when he entered college. The close relationship, however, between Blank and his father Max is quite evident. He credits his father with teaching him the importance of customer service and the human element in business dealings. "I have such fond memories of my father," Blank wrote. "As a pharmacist, he was always helping people." "People often describe me as complex or complicated, and I am probably not an easy man to live with, at home or at work. Part of that comes from my fiercely competitive nature; part of it is my grinding need to climb, to achieve, to do." 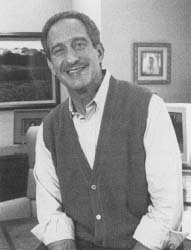 Arthur M. Blank was born in Queens, New York, in 1942. His father worked as a pharmacist and his mother was a housewife. When his father died at age forty-four (Blank was fifteen), his mother was forced to take over the family pharmacy even though she had no previous business experience. In addition, she had Arthur and his brother, Michael, to finish raising. Academically, Blank was an average student in elementary and high school. He was always athletically inclined, playing baseball and football, and running track in high school. In baseball, he started as a centerfielder but was forced to switch to catcher when he injured his throwing arm. He apparently got his athletic abilities from his father, who excelled in track at Columbia University in New York. After graduating from high school, Blank attended Babson College, a small business school near Boston, Massachusetts. It was there that he began to take his education seriously. Blank's outgoing personality made him popular with the other students. He was elected vice president of his junior class and president of his senior class. He was a straight-A student and made the dean's list. With a limited family income, Blank had to help pay his way through college. Since he loved being outdoors, he started his own landscaping business. He also earned money by doing laundry several nights a week for other students. While Blank studied business, his brother majored in pharmaceutical science. The plan was for the two to take over running the family pharmacy from their mother, Molly. Blank graduated from Babson in 1963 with a degree in accounting, but he had second thoughts about joining the family pharmacy. Instead, he took a job with the New York accounting firm of Arthur Young & Company where he worked for about five years. In 1968, Blank decided to go to work for the family pharmacy, but he was there for only a few months before his mother sold it to the Daylin Corporation. In 1970, Blank became chief financial officer (CFO) for Elliot's Drug Stores/Stripe Discount Stores, a Daylin subsidiary. Two years later, he became president of the division and moved to Griffin, Georgia, with his wife, Diana, and their three children, Kenny, Dena, and Danielle. In 1974, Daylin sold the Elliot's/Stripe division and Blank went to work for Bernie Marcus at Daylin's Handy Dan division of home improvement stores. He remained there until 1978, when he and Marcus were fired. A year later, the pair started the Home Depot with three stores in Atlanta. He became CEO of the company in 1997, a post he held until he retired in 2000. In 2002, he bought the National Football League's Atlanta Falcons and serves as its president, CEO, and chairman. He lives with his second wife, Stephanie, and their three children, in Atlanta. Blank is on the board of trustees of the Carter Center, Emory University, the National Conference of Christians and Jews, and the North Carolina Outward Bound School, among others. He is a member of Babson College's Entrepreneurship Advisory Board and Academy of Distinguished Entrepreneurs. He established The Home Depot Entrepreneurial Scholarship program for undergraduates, as well as the Arthur M. Blank Family Foundation. Blank was also recognized by the City of Hope cancer research center for leadership in fund-raising. He and his wife, Stephanie, have donated $73 million to charitable groups. Many people assumed that because Blank cofounded the world's largest home improvement chain, he must be a whiz of a handyman. But Blank was more comfortable with a baseball bat in his hand rather than a hammer. "I never had the opportunity to be handy because I was raised in an apartment," Blank said in Built From Scratch. "I was always out in the street, playing ball and running around with my friends. There was nothing made of wood around our house—everything was cement, bricks, and block. I didn't live in a single-family home until I was 31 years old." Blank, Arthur M., et al. Built From Scratch. New York: Times Books, 1999. Armour, Lawrence L. "Home Depot: Now It Can Be Told." Your Company (May 1, 1999): pp. 18-19. Blank, Arthur. "They Sweat the Small Stuff." Canadian Business (May 28, 1999): pp. 51-55. Gibbs, Lisa. "Room for Improvement: Home Depot's New CEO Wants to Remodel the Retailer—and Restore a Faded Growth Stock." Money (March 1, 2002): p. 33. Lamm, Marcy. "The Nuts and Bolts of Hardware Success: How Home Depot Captured Imagination." Atlanta Business Chronicle (November 6,1998): p. 3A. Pellet, Jennifer. "Mr. Fix-It Steps In." Chief Executive (October 2001): p. 45. Saporito, Bill. "The Fix is in at Home Depot. "Fortune (Feb. 29, 1988): p. 73-76. "Tidying Up At Home Depot." Business Week (November 26, 2001): p. 102. Home Depot, Inc. [On-line] http://www.homedepot.com (accessed on August 15, 2002).